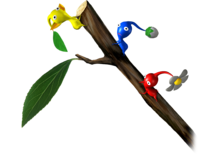 Artwork of A Red, Yellow and Blue Pikmin climb up a stick. Climbing sticks (known among fans as twigs prior to Pikmin 3) are obstacles found in Pikmin and Pikmin 3 that require Pikmin to build and shimmy up them. They are somewhat similar to bridges, but they are not used by leaders, nor by Pikmin carrying something. Sheargrubs and Shearwigs will fortunately not dismantle these useful ladders, although they are automatically leveled every day after sundown in Pikmin. They are found in every level in Pikmin except The Forest of Hope and The Final Trial. In Pikmin 3, Pikmin that carry objects on a route will use climbing sticks. Some climbing sticks need to be built, while others are already built. In Pikmin, an interesting event that can happen is that there is a good chance that one or more Pikmin will start climbing the stick while other Pikmin are working on it. This is commonly seen on The Impact Site, when the player wants to bring 100 Pikmin up the trunk. Swarming the climbing stick will increase the chances of this happening. Additionally, swarming many Pikmin on a finished climbing stick might cause some Pikmin to get stuck on the bottom. There is only one climbing stick here, near the Red and Blue Onions leading to 10 pellets of each color. In The Forest Navel, climbing sticks appear very often. One is near the #1 Ionium Jet and some bomb rocks, that is used as a shortcut to the section behind the Blue Onion, while another is near the Crimson Candypop Bud where an Iridescent Flint Beetle also resides. A third climbing stick is next to a black reinforced wall, and is needed to reach the Automatic Gear. The final one can be found near the outer edge of the landing site next to a Honeywisp, and is used as a small shortcut back to the landing site. In The Distant Spring, climbing sticks are a bit less common. There is one behind the S.S. Dolphin and the Blue Onion, one close to a bomb rock stash near the bridge to the Gluon Drive, and another in a small pit near the UV Lamp. Near the cliff near the Dodge Whistle. One in the Vehemoth Phosbat arena, providing access to one of the fragment piles. One in the area where the Vehemoth Phosbat is first encountered, providing access to a bunch of Dusk Pustules. Near the waterfall. Provides access to Story Mode's only Mock Bottom. A stick pile in Pikmin. A fully-built stick in Pikmin. A pile of sticks in Pikmin 3. A completed stick in Pikmin 3. This page was last edited on March 10, 2019, at 12:20.